(Nanowerk News) In a move that slashes 90 percent of the cost of mass-producing metastatic microtumors and therapeutic microtissues for screening and research, Rice University bioengineers have adapted techniques from the "maker" movement to reprogram a commercial laser cutter to etch up to 50,000 tiny "microwells" per hour into sheets of silicone. The fabrication technique, which was developed with open-source software and hardware, is described in a new study published in the journal RSC Advances ("Ultrahigh-throughput generation and characterization of cellular aggregates in laser-ablated microwells of poly(dimethylsiloxane)"). "Microwells can be used to grow tiny clusters of cells," said Rice bioengineering researcher Jordan Miller, the lead researcher on the new study. "These clusters, or multicellular aggregates, contain 50-100 cells and have many potential applications, but they have been difficult to mass-produce. In the field of cancer biology, multicellular aggregates are used to model cancer micrometastases -- small microtumors that can occur in high numbers in cancer patients. And in the field of regenerative medicine, they can be used as living building blocks to fabricate tissues and organs from a patient's own cells." To study micrometastases in the lab, researchers grow multicellular aggregates of tumor cells. Traditionally, scientists have formed these by manually placing individual droplets of cells onto a plate using a pipette. But Miller said this method is labor-intensive, highly variable and typically produces small numbers of usable samples, which makes it impractical for studies that may require thousands of aggregates. "Recent studies have revealed that cancer patients can have microtumors throughout their bodies," Miller said. "Most of these remain dormant, but some will actually grow into a full-blown tumor that can threaten the patient. We don't know exactly how the environmental conditions around a microtumor can promote or suppress this dangerous transition, but one way to investigate this process is with screening studies that involve large numbers of aggregates placed into defined environments." One method for making many multicellular aggregates at once is to place cells onto a test plate containing several thousand microscopic wells, or microwells. Although commercial microwell products are on the market, Miller said they can be expensive, and the wells also come in a limited selection of shapes and sizes, which can make it difficult to produce small aggregates. Miller and graduate student Jacob Albritton, the lead author of the new study, found they could produce up to 50,000 microwells per hour by developing hardware and software modifications for a commercial CO2 laser cutter -- the same kind of machine used to make trophies, jewelry, toys, acrylic figurines and other commercial products. "We found we could create a conical well with a millisecond laser pulse in a sheet of poly(dimethylsiloxane), or PDMS," Albritton said. The material is a silicone-based organic polymer that's commonly used in industrial fabrication. This polymer is also nontoxic to living cells and is used often in biological experiments. "When the laser flashes across the surface, it's like a Gatling gun, and you can see little spouts of flame from each strike," Albritton said. 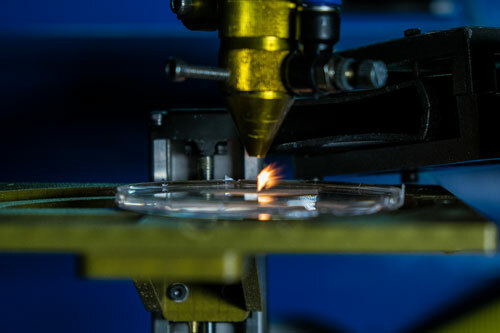 "Our laser-based fabrication method can achieve something that standard lithography cannot: sharp, conical depressions that help guide the cells into a single aggregate. Regarding production costs, Miller said, "Using our technique, it costs around $30 to fabricate 100,000 microwells. This is less than one-tenth the cost of commercial sources." Albritton said, "When we seed cells onto microwell sheets, they settle into the bottom of each microwell and form into aggregates overnight." He said the team found it could produce wells of different depths and shapes simply by varying the power and duration of the laser pulses, a technique that could produce specialized microwells that haven't been available previously. "We theorized and then demonstrated that the focal plane controls the shape of the microwell that can be fabricated, and our new software modifications allow ultrahigh-throughput production," Miller said. Miller, assistant professor of bioengineering at Rice, said a wide range of interdisciplinary skills was needed to develop the microwell fabrication system. "We're using knowledge from electrical engineering to override the electronics of the laser cutter with open-source hardware and software," Miller said. "We bring in knowledge of biomaterials to etch and surface coat the silicone membranes, and there's also a good deal of cell biology and bioengineering that's needed to grow the multicellular aggregate tissues. Computer vision algorithms enabled us to automate analysis of tens of thousands of microtissues we can produce every day." He said the team has open-sourced its hardware designs and software modifications by sharing them via Github, which empowers other groups around the world to reproduce the technique. Miller, an expert in 3-D printing and active participant in the open-source maker movement, said he understands that some biomedical labs might balk at purchasing and rewiring a commercial laser cutter, so his team also demonstrated a way to make polyurethane casts of completed sheets of microwells. 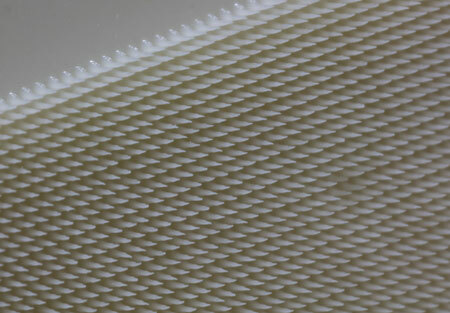 Using these polyurethane microneedle templates, a lab could then make as many copies of microwell sheets as needed simply by casting new silicone over the microneedles. "Our next studies here at Rice will investigate early steps of cancer progression as metastatic microtumors begin to infiltrate the surrounding tissue," Miller said. "And we've already distributed microwells to several other research groups around the country who have expressed interest in collaborating."